We're into week number three of The Food Matters Project now...and it's my turn to host (and pick the featured recipe). Yay! Can I just say that this was no easy feat? I have a ridiculous number of pages bookmarked in The Food Matters Cookbook. Reeeeeediculous. So really, it was a matter of choosing a few ingredients that I was in the mood for and searching. A little more involved than closing my eyes, flipping the pages, and stopping on one. Which I almost did. So. Considering my current torrid affair with goat cheese, you can bet that it influenced my decision to make this dish. It's called a "pesto". Yup, quotations and all (which I imagine are in place since it's not a traditional, leafy green herb-packed pesto). But that said, I've adored pretty much any variety of "pesto" I've tried. A favorite of mine is actually another red version that uses sundried tomatoes. So. 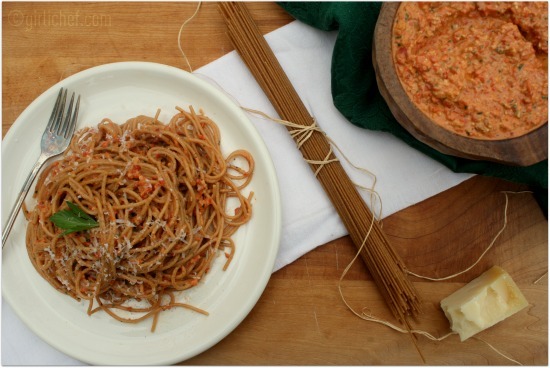 Red pesto. Involving goat cheese (if you choose...it's actually a variation). 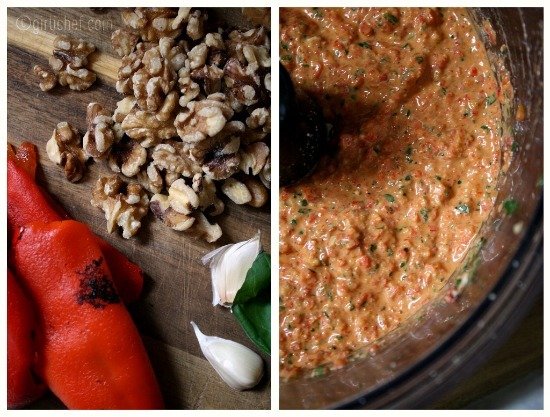 Also involving earthy, beautifully roasted and charred red peppers and fat, oily walnuts. But no worries...you can still find a bit of green in here with the bright, summery addition of basil. It is optional, because afterall...it's not summer everywhere and not everybody has access to greenhouse-grown herbs. But if you can find it, try it- it adds another great dimension to the layers of flavor. As predicted, I was hooked. 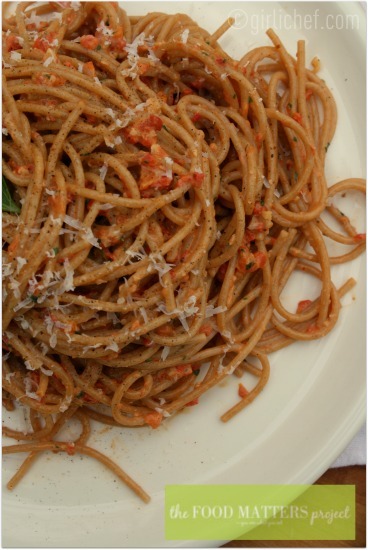 Initially I tossed it with some whole wheat spaghetti topped with a few crushed red chile flakes and a good grating of Parm for a lunch that induced unsolicited oooh's and aaah's the entire way through. The creaminess lent by the addition of that goat cheese perfectly accented the hot bites of garlic and nutty, oiliness of the walnuts while tempering the rich sweetness of the roasted red peppers. Happy belly and gloriously stinky garlic breath. That's what I call satisfaction. I wound up using the extra as a dipping sauce for crudites the following day...and slathered it in the center of an omelet the next. Coarsely ground walnuts add a nice crunch and some richness while balancing the sweetness of the roasted red bell peppers, making a purée you can use in dozens of ways, just as you would any herb pesto. Pulse the garlic in a food processor until finely chopped. Add the walnuts and pulse a few more times to break up any large pieces. Add the roasted red peppers and basil and process, streaming in the oil as you go, until all the ingredients are well combined and as coarse or as smooth as you want them. Sprinkle with salt and pepper and serve immediately with crudités, crostini, or vegetable chips, or spread on sandwiches or toss with pasta. Store in a covered airtight container in the fridge for a day or so, or freeze. 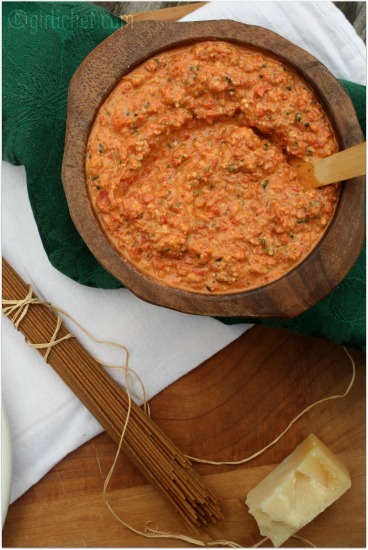 Add 1/2 cup crumbled goat cheese or feta or grated Parmesan when you add the the roasted red peppers. Substitute 2 cups cooked (or canned) and drained cannellini beans for half the roasted red peppers and proceed with the recipe.